The 2018-2019 Jazz at Princeton University season under the direction of Rudresh Mahanthappa presents a dynamic roster of guest artists including trumpeter Ambrose Akinmusire, vocalist Nnenna Freelon, and drummer Terri Lyne Carrington alongside student ensembles led by faculty members Mahanthappa, Trineice Robinson-Martin, Darcy James Argue, Jay Clayton, and Matthew Parrish. Highlights include performances by student groups joined by guest artists including Blue Note Records trumpeter Ambrose Akinmusire, legendary vocalist Nnenna Freelon, and Grammy winner and drummer Terri Lyne Carrington. In April, Jazz at Princeton will present Princeton University's first-ever outdoor Jazz Festival. "This year's Jazz at Princeton program is going to be extraordinary," says Mahanthappa. "With the contribution of so many of jazz's most articulate voices – both as guest artists and ensemble leaders – we are thrilled to offer performances that will engage, inspire and entertain students, educators and the community at large. I am also excited that we'll be hosting our first outdoor jazz festival." 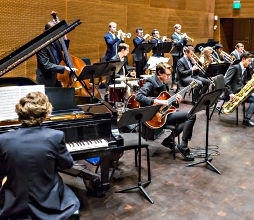 Jazz at Princeton's six major student ensembles include the Creative Large Ensemble directed by Darcy James Argue, Small Groups I and A directed by Mahanthappa, Small Group X directed by Matthew Parrish, the Jazz Vocal Collective directed by Trineice Robinson-Martin, and the Vocal Improvisation Ensemble directed by Jay Clayton. Also, The Richardson Chamber Players, Princeton University Concerts' resident ensemble of performance faculty, distinguished guest artists and supremely talented students, offer a Sunday afternoon concert of mixed chamber works on November 11, 2018 at 3PM in Richardson Auditorium, Alexander Hall. "Vocal Currents: Music in our Changing World" reimagines and redefines today's music by bringing YPC's young singers together with composers to spark their visions and imaginations to create the music of tomorrow. Vocal Currents launches with Artistic Director Francisco J. Núñez and Associate Artistic Director Elizabeth Núñez conducting YPC in eight 2018 YPC commissions and a choral arrangement of a 2010 work. On Saturday, November 17, 2018 at 8:00pm at Alice Tully Hall, Lincoln Center, NYC, American Classical Orchestra (ACO) presents "Imperial Haydn," with guest soloist Aisslinn Nosky (violin) and ACO principals Marc Schachman (oboe), Andrew Schwartz (bassoon), and Myron Lutzke (cello). Along with Haydn's "L'Impériale" (No. 53), the program also features his Sinfonia Concertante in B-flat major and a rare performance of Kalliwoda's Symphony No. 5 in B minor. The orchestra's current season includes two more concerts at Lincoln Center: Joyous Bach, featuring ACO principal flutist Sandra Miller and The ACO Chorus (Thursday, March 7, 2019 at 8:00pm); and Beethoven's Eroica, a performance of the composer's monumental Symphony No. 3, preceded by his Coriolan Overture (Friday, May 17, 2019 at 8:00pm). In addition, ACO is presenting two salon concerts at landmark New York City venues: Bass (Thursday, January 24, 2019) a revelatory look back at the instrument's role in classical music, with ACO principal bassist John Feeney; and "A Ladies' Journey 1876" (Thursday, June 6, 2019), an evening of 19th century parlor music with soprano Christina Kay, Alex Cook on horn and Gwendolyn Toth on fortepiano. Musica Viva NY commemorates the 100th anniversary of the end of World War I with a program entitled the "End of the War to End All Wars" on Sunday, November 11 at 5:00 p.m. at All Souls Church, NYC. The concert features mezzo-soprano Barbara Dever and the Musica Viva NY Choir led by Artistic Director Alejandro Hernandez Valdez performing works by composers directly affected by World War I, including Ravel's Le Tombeau de Couperin and Holst's Ode to Death. Also on the program is a NY premiere for choir and chamber orchestra based on texts by World War I poets composed by Joseph Turrin, co-commissioned by Musica Viva NY, the New Orchestra of Washington, and the Washington Master Chorale. Tickets, priced at $40, are available by visiting musicaviva.org/tickets or can be purchased at the door. For discounted pricing, please visit musicaviva.org for details. New York Festival of Song--the "engaging, ever-curious series" (The New York Times)--opens its 2018-2019 season by delving into the world of W. C. Handy, often referred to as the "Father of the Blues," and his vast influence as a prominent African-American composer and publisher in the early 20th century. The concert takes place at Merkin Concert Hall, NYC, on Wednesday, November 14 at 8:00 p.m.
On Site Opera (OSO) will present Gian Carlo Menotti's holiday opera, Amahl and the Night Visitors, at the Holy Apostles Soup Kitchen December 6-8, 2018. In partnership with Breaking Ground, New York City's largest provider of permanent supportive housing for the homeless, performances will feature a chorus made up of community members who have experienced homelessness. Tickets will be free, part of OSO's "Opera Free For All" initiative, though the company asks that all attendees bring a small donation of non-perishable food items, to be given to the Holy Apostles Soup Kitchen. Don't miss "Vocal Currents," the newest commissioning series from Young People's Chorus of New York City: Saturday, November 3 at 8:00 p.m., at the Merkin Hall at Kaufman Music Center, NYC. "Vocal Currents: Music in our Changing World" reimagines and redefines today's music by bringing YPC's young singers together with composers to create the music of tomorrow. Tickets on sale now at KaufmanMusicCenter.org: $25 general admission | $15 students. The Rector, Wardens and Vestry of Saint Thomas Church Fifth Avenue announce that Dr. Jeremy Filsell has been called as Organist and Director of Music to succeed Daniel Hyde who is returning to the prestigious King's College, Cambridge in the Spring of 2019. As a U.S. citizen and a British subject, Jeremy is uniquely placed to lead the finest professional choir of men and boys in North America, whose life owes much to the great English choral tradition since T. Tertius Noble was invited to found the Saint Thomas Choir School in 1919. "I am very excited to welcome Jeremy to join a hard-working team at Saint Thomas Church and to build on the great legacy of his predecessors. Jeremy not only has an international reputation on the organ, but is also passionate about music changing peoples' lives, and I know how much he is looking forward to leading our Choir as its unique Choir School celebrates the centenary of its founding," said the Rector, Canon Carl Turner. World Music Institute presents two celebrated instrumentalists who ruminate on their common roots and love of traditional Balkan and classical music with original works and arrangements of Erik Satie, Manuel de Falla, and the mournful music of sevdah—sometimes called 'Bosnian blues.' Known for their sheer virtuosity combined with a blend of improvisation and jazz with their sound, they are able to create powerful, distinct sound-worlds through their own compositions as well as their own arrangements of folk and classical works. Bosnian-born Merima Kljuco is one of the world's finest concert accordionists. She is a frequent guest soloist with orchestras including the Scottish Chamber Orchestra, Netherlands Radio Philharmonic Orchestra and Holland Symphonia, and has worked with internationally renowned artists and ensembles such as Theodore Bikel, MusikFabrik and the Schönberg Ensemble. An acclaimed guitarist of Bosnian, Serbian and Croatian origins, Miroslav Tadic has performed and recorded with luminaries such as Terry Riley, Plácido Domingo, Wadada Leo Smith, the London Symphony Orchestra and the Philharmonic Orchestra of Monte-Carlo. He has also recorded duo albums with such luminaries as guitarists Vlatko Stefanovski, Dusan Bogdanovic, vocalists Teofilovic brothers, and saxophonist Peter Epstein, and he is on the faculty of the Herb Alpert School of Music at CalArts. Meet the Juilliard Grads in "Vivaldi the Teacher"
Meet the Future of Period Perfomance! November 7-11, Philharmonia Baroque Orchestra welcomes three recent graduates of the Historical Performance program at The Juilliard School. Violinist Alana Youssefian (Class of 2018), oboist David Dickey (Class of 2016) and cellist Keiran Campbell (Class of 2017) have all been instructed by PBO musicians during their studies. Now, they are coming to PBO to reunite with their former teachers Elizabeth Blumenstock, Gonzalo X. Ruiz and Phoebe Carrai to perform Vivaldi double concerti in "Vivaldi the Teacher." PBO is pleased to introduce you to our November Guest Artists in the following videos. Unison Media's acclaimed concert series The Crypt Sessions continues its third season on November 14, with French/Spanish guitarist Thibaut Garcia, performing a program of music composed and inspired by Bach - centering around his towering Chaconne, and also including music by 20th Century composers Heitor Villa-Lobos, Agustín Barrios Mangore, and Alexandre Tansman. The program stems from Thibaut's new Erato album "Bach Inspirations," which was released October 5. The young guitarist spent six months touring the U.S. in 2016-17, playing over 50 dates across the country while witnessing a period of profound social and political change.